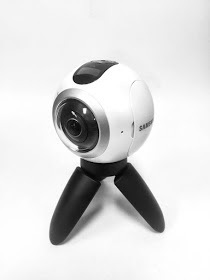 The Samsung Gear 360 is the most affordable 4k 360 camera right now (around $350 to $400 on eBay), but it is compatible only with the latest flagship Samsung smartphone (Galaxy S6 and above). It does come with a desktop-based software, Cyberlink Action Director, for stitching photos and videos, but the software is for Windows only, and can also be a little picky with older graphics cards. It is possible to use the Gear 360 without a compatible smartphone, but these restrictions make the Gear 360 harder to use for someone who uses a Mac and/or a non-compatible phone. Someone like Martin Smith. Martin is a Mac user who was planning to get the Samsung Gear 360 (you might recall he was also recently featured in a post about the Brahma Duo rig), but we were not sure about whether he would be able to stitch the Gear 360’s output. 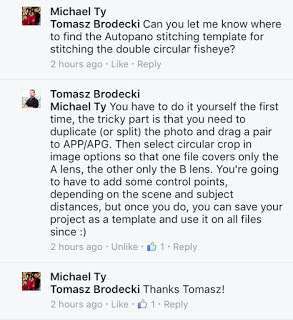 I provided him a sample video so that we could see if he could use his Autopano Video to stitch the double circular fisheye output. And it turns out that yes, it is doable! 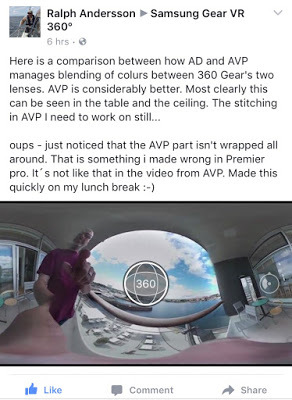 Check out his blogpost for the sample video stitched by Autopano, and the backstory of how he decided to get the Gear 360. Another benefit of Autopano is that can correct the color differences between the two lenses that many people have been concerned about. Check out this Facebook post with sample video.